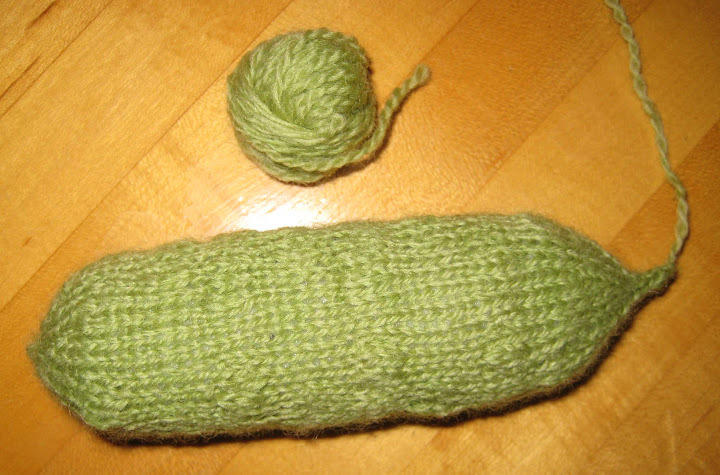 I knit this pickle with my hand dyed "green tea" yarn as directed. My pickle is closer to 5" tall (versus 3.5"), but I didn't check my guage first so it was my own fault. I was slightly surprised that the pattern was not symmetrical for the bumps, but then again, what pickle is symmetrical? A random aside: Stuffed toys tend to start with a small number of stitches, and you usually have these divided evenly among 3 or 4 needles. It is a minor annoyance, when executing the decreases at the end of the toy, when you need to make a K2tog over the border of two needles. (It is not that it makes the project take longer, I just like it when things work out well!) I was pleasantly pleased to see that the decreases in this pickle happened without the need for rearrangement! Were you a good girl/boy?